We offer to you here a whole loaf approx. 5.5 kg. of a real half-fat Tilsit, made after traditional prescription of daily freshly put raw milk and high-class-checked rennet. The half-fat Tilsit is a mild, fat-diminished (max. 35% F.i. T.) cut cheese with pea-shaped punching whose ripening period amounts at least 6 weeks. ready for shipment: in stock Lord of Whisky Cheese DEGUST approx. 500 gr. As soon as the cheese is mature, it is rolled in black pepper. This gives it a covering of black pepper that rounds off its spicy, peppery flavour: a subtle, tasty combination of flavours that guarantees perfect satisfaction. 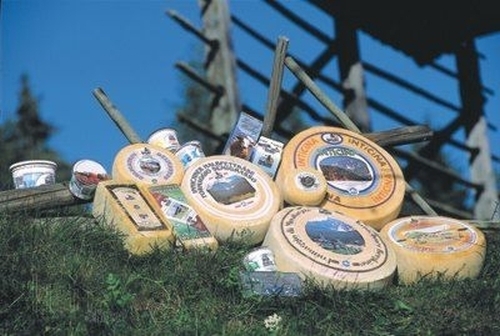 Pleasant Cheese - Tilsit cheese. A low fat content. Raw milk cheese with herbs approx. 700 gr. Neuhaushof 17,90 EUR / 25,57 €/kg. only 35,25 EUR / 17,63 €/kg. 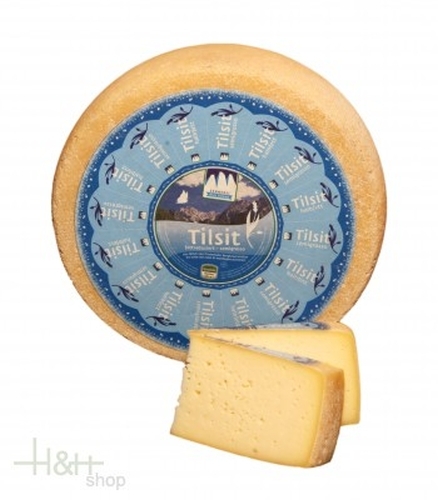 Pleasant Cheese - Tilsit cheese. A low fat content. ..